Vitsoe has won a Leamington Society Award (2018). 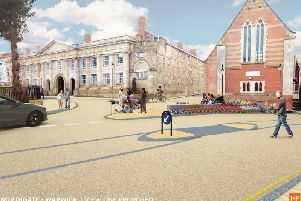 Development and restoration projects ranging in size and scale have again been recognised by the Leamington Society. The Chairman of the Warwick District Council, Cllr Stephen Cross, introduced the evening and praised the quality of the Leamington Town environment, which this occasion celebrates. This year there were 27 nominations and 14 awards given (eight of the winners are pictured in our gallery above). These were for a whole range of projects, varying in size from cast iron work to a garden in Russell Terrace to the headquarters of two major companies, Tata Technologies and Vitsoe. Maintenance of the historic character of the town was represented by the restoration of a house in Avenue Road, buildings in Bath Street, Warwick Street and the new Platform 3 refreshment room at Leamington station. Sympathetically fitting new buildings into the urban structure was recognized for a house in Oxford Street, a Wellness Centre in Augusta Place, retirement homes on Lillington Avenue and apartments and town houses on Rugby Road. Stylishly catering for social and leisure needs were a local authority housing scheme for the over 55s, on Tachbrook Road, housing for those with learning difficulties in Bath Place and a skateboard track in Victoria Park. The awards were presented by the Mayor of Leamington Spa, Councillor Heather Calver and the evening ended with a short address by Johnathan Holdercroft, Head of Corporate Affairs at Chiltern railways, the evenings sponsors, who stressed the close links the company had with the Town and the Society.